We have found the following article from @thehaiticollective helpful in giving some context to the recent upheaval in Haiti. Things have slowly improved this week as the Prime Minister invited the population to resume normal activities. People are cautiously optimistic. We hope the school will be open soon to resume classes and the daily meal program. Thank you for your prayers. Over the past several days, many have been asking about what is going on with the crisis in Haiti. We are not a news outlet, and we don't pretend to be. Unfortunately however, much of what is happening is not easily accessible as the situation in Haiti has not garnered the attention it deserves. The purpose of this update is to try to give you a better understanding of the situation with a top 10 list of information regarding "Operation Lock Down Haiti". We do not take a side but rather call on everyone to pray for God to intervene and cause peace, righteousness, and truth to reign in Haiti. 1. The instability began with a failed electoral process and fragile transitionary government back in 2015/2016 as the president was elected with less than 20% turnout. Fast forward to July 2018, a nationwide protests across Haiti ensued against the PetroCaribe corruption scandal with Venezuelan oil money appropriated for Haiti. The end of Venezuelan oil has contributed to a fuel crisis which only worsened with exclusive contracts with companies who refuse to deliver new shipments when Haiti cannot pay their outstanding debts to the tune of $35 million. 2. Protests have been off and on throughout Haiti since July, but they escalated to another level on February 7. This is now the 9th day of what has been called “Operation Lock Down Haiti” – the goal of which is to shut down all aspects of Haitian life – political, social, economic, educational, and even medical. 3. The majority of the protestors are between the ages of 18 and 25 where unemployment is over 80% and who largely supported and believed the promises of the current political party in power – PHTK (which has largely been backed by the international community). Jovenal Moise, a banana farmer, was hand-picked by his predecessor and former president, Michel Martelly. 4. Here’s a sampling of the things that have happened over the last 8 days: most primary roads in and out of cities have been barricaded with boulders or burning tires, littered with rocks which have been thrown at vehicles; several gas stations have been looted; HQ for Haiti National Television was set on fire with many cars burned; 78 prisons escaped Aquin prison in south Haiti; journalists have been pressured and attacked, leaving one wounded with a gunshot to his hand; a one former police commissioner and wanted fugitive attempted to make his way into the national palace before being arrested by PNH. 5. On Tuesday of this week, President Moise recalls the Haitian Ambassadors to the United States (Paul Altidor), the United Nations (Denis Régis), and Mexico (Guy Lamothe) in the midst of the nationwide revolt, leaving Haiti without formal representation. Haitian Ambassador to France (Vanessa Lamothe Matignon) also resigned this week. Haiti’s Foreign Minister Edmond Bocchit is scheduled to meet with US National Security Advisor, John Bolton regarding the current security threat in Haiti. 6. The Haitian Gourde (HTG), which had already been depreciated to $1 USD = 65 gourde dropped dramatically to $1 USD = 87 gourde within a week, crippling the purchasing power of the already devastated poor. Everyone is sheltered and virtually in “lock down” with each passing day become a battle of the wills – the will of the people vs. the will of the government in who will outlast who. Extreme scarcity of food and water has Haitians protestors out with rocks in pans, exclaiming how tired they are of being hungry and needing help. 7. Many foreign workers and American mission teams have been evacuated via helicopter to the airport as roads are impassible. While helicopter evacuations are extremely expensive, they are nonetheless in great demand. Still several are stranded, unable to evacuate from their current location. 8. Hospitals and emergency services have struggled to stay in operation as they are short on supplies. Not only are basic necessities scarcely available, so are basic social and humanitarian services which are critical in times like this. 9. Last night, President Moise spoke for the first time since the start of Operation Lock Down in which he claimed support of the international community while appealing to the opposition parties to dialogue with him. He made it clear he will not resign and hand over control of the country to what he considers gangs and drug lords. Haitian Prime Minister Ceant refuses to resign or take responsibility for what has happened, though President Moise puts the finger of blame squarely on him. 10. In the aftermath of President Moise’s speech to the Haitian people, increased demonstrations and outbursts of violence are expected. Within an hour, the United States changed its travel advisory to Level 4: Do Not Travel, the highest travel advisory. The US government recognizes its limitations and inability to secure the safety and welfare of its citizens who enter into Haiti under such conditions. Please continue to pray for #Haiti. Our founders’ grandson, Caleb Scott, is participating in the NFL’s #mycleatsmycause for charity. He chose Haiti Child Sponsorship and Young Life Haiti to support. The cleats are on auction through Dec 12, 7pm. Bid here. 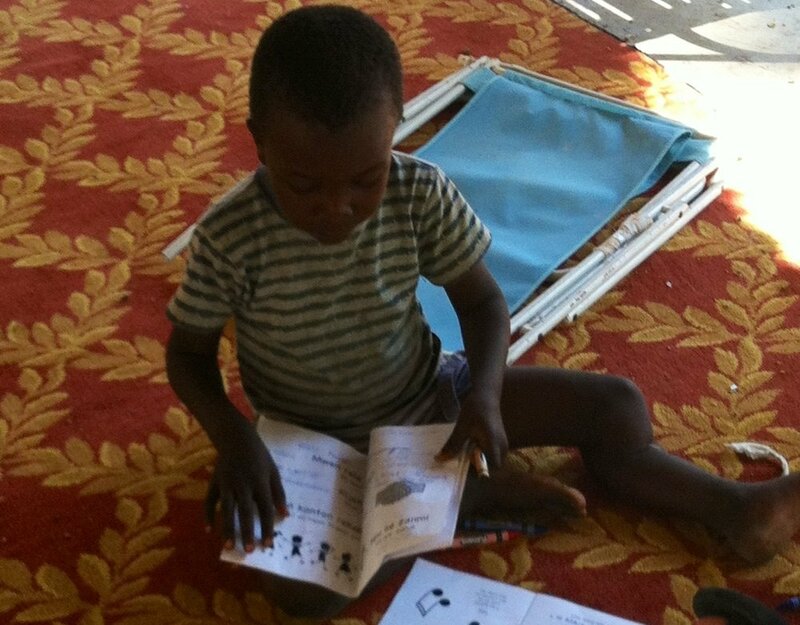 This story is written by Jenna Scott, Haiti Child Sponsorship founders' grand-daughter. Jenna recently served in Haiti for 6 weeks of a 10 week medical internship (cut short by the recent riots and civil unrest). Ken’s story did not start with me. In fact, I am not exactly sure when or where Ken’s story did begin. I don’t even really know how to spell his name. I do know that he and I will never be the same because of the way that the Lord intertwined our lives. Hopefully one day Ken will write down his own story and fill in all of the missing pieces. Until then, I can tell you the little bit that I do know. For starters, I know that some eleven years ago, Ken was born in Haiti, probably in a mountain village called Maissade. I know that his parents are no longer in the picture, that he did not start school with other kids his age, that he has experienced great pain, and most importantly, I know that God loves him and has been looking after him throughout his entire life. The Streets of Maissade, where Ken grew up. At some point in Ken’s early childhood, a serious infection developed in his knee. I don’t know what caused the infection, but I wonder about it often. Maybe he scraped his knee playing soccer; maybe he was burned. Maybe he cut his knee on a rock in the river. Whatever the cause, the impact was severe. Neglected, the infection intensified until at some point there were maggots festering in the wound. The abscess could no longer be ignored, and the time came for Ken to see a doctor. I’m not sure who the doctors were or what they did, but I know that what was left was dysfunctional. And so, sometime before the age of six, Ken was crippled. At least two years passed by before I met Ken. He transitioned to a new home with his aunt and cousins. He became accustomed to the physical and cultural consequences of being disabled. When I met Ken in 2014, his was just one precious face among about fifty others. I was sitting in the park with a box of band-aids and a line of kids waiting to be “treated”. I noticed two kids cut the line. The older of the two grabbed my attention and pointed to his younger friend’s leg. At first glance, it looked as though it was broken, and his lower leg was dangling at the knee. My stomach turned, and my first instinct was just to pick him up and love on him as best I could. This was just a week-long trip after all. We’d been going to Maissade for three years and I had not once met this family. For all I knew, the boys would not return to the park while my team was visiting. So, I asked all of the regular questions. I learned that their names were Olande and Ken. They were cousins. Ken was eight years old. Olande did go to school. Ken did not. The more I talked to the pair of them, the more my heart ached for Ken. I decided to adopt him into my arms for the rest of the week, and I started to dream about what I could do for this boy. The Lord had given me a mission. I knew from that moment on that Ken’s story would not be about a boy who fell victim to the brokenness and hopelessness surrounding him, rather that he would become strong enough to walk, jump and praise the God who made it all possible. The people of Maissade would recognize him and be filled with wonder and amazement at how the Lord had entered into his brokenness and made him whole. I held Ken every day that week, and when it came time to leave, I made a promise to him that I would be back. The next time I saw Ken was in a post-op room at Adventiste Hôpital in Port-Au-Prince after his first surgery. A miracle surgery that was only possible because of the Lord’s goodness, His connections and the generosity of my community back home. Due to the complexity of his condition, an external fixator was required to align and lengthen his leg. He moved to Port-au-Prince with his older cousin Edna to be closer to the doctor for follow up appointments. With extra money raised from his initial surgery, we were able to support Edna as she cared for Ken. Little did we know, Ken would undergo four more surgeries to date. I have kept a close relationship with him since that day, seeing him at least once a year when my team travels to his hometown. I am always blessed to see how his resilient spirit impacts the people he encounters. This journey has been difficult. I am often reminded how powerless I am in the midst of the brokenness of this world, BUT the Lord is faithful when it feels hopeless, and He is good despite the circumstances. I was reminded of this truth this past July 2018 when I had the opportunity to see Ken at the Beach in Haiti. All little boys grow up, and Ken is no exception. He has shot up in height over the past year. I can hardly imagine that I used to carry him on my hip not too long ago. We smiled together as he stepped into the ocean for the first time. I watched him be amazed by the waves, the sand, and the seashells. He gaped at the giant crabs being sold by beach vendors. We built huge castles in the sand, and I watched as he learned not to build his fortress too close to the water if he didn’t want to watch it wash away. Despite the pain of his life, and the hardships he has endured at such a young age, he has a type of gentle joy that reminds me of the goodness in life, the goodness that comes from God. Ken’s story is not over. He is still in physical therapy after his last surgery, and there is a possibility of future surgeries to make sure his legs grow at the same rate (he really is growing so fast). It is my hope that he continues his education and has all of the resources he needs to thrive in life. Ken’s story did not start when I met him, and The Lord was looking after him far before I ever looked into his big brown eyes, and The Lord will continue to be in control as we navigate life together. The sweet faces below are of students peeking under the door of the church during Teacher Appreciation Day at the school last week. What they saw was their teachers being celebrated, honored and thanked for their dedication and service -- each teacher receiving a gift and certificate of Appreciation. The children were so excited and got a glimpse that education matters and their teachers are valued and loved. We just returned from a very good visit in Haiti. A year ago for my 80th birthday wish, I asked you, our donors, to consider giving to build the new church/multipurpose building at the school. You all responded in such a wonderful and generous way that a year later, just 2 weeks ago, we dedicated the beautiful new building! It had been a long, eight years since the earthquake toppled the church...Hundreds gathered to celebrate...Three weddings began at 7am to begin the day...There was joy, laughter, singing, and dancing! Mary and I were asked to “cut the ribbon “ before the service. We recruited Chedrick’s two beautiful daughters, Pastor Tito’s two granddaughters, to share in the wonderful occasion. A GREAT and unforgettable day! MERCI! THANK YOU!! "My name is Reynaldo. I live with my parents and one brother. I am in 7th grade. For me, the school represents the pride of the area and of every kid who has a chance to receive education from this prestigious school. Very often people don't like to give good things to poor people but I can say that people at this school make a difference. Every day I receive good education from my teachers, good food from the kitchen and they make me feel that I am important. The school is a really good thing that is offered to poor people in Haiti. Sincerely, my parents would never be able to send me to school if that school didn't exist because they are not working. My favorite subject at school is Physical Sciences because I understand it better. When I graduate from High School, I would like to go to a university where I will study to become a doctor. I think like that I will have an opportunity to give back to people in my country. Thank you very much to God and to all of you who have combined your strength to make a dream become a reality (My school). God bless you." Church / Multi-Purpose Building Funded!! When the earthquake hit Haiti in 2010, the large church/multipurpose building of the school was completely destroyed. Fortunately, school was out at the time, but a vital part of our school complex was gone. Nearly a year ago I was about to turn 80; my birthday wish was for the construction of the new church/multi-purpose building. Your response to my wish has been overwhelming! We are pleased to show you the picture of the building alongside the architectural drawing. The exterior of the building is complete and beautiful! However, we do need benches for the interior. Chedrick tells us that each bench/pew will cost $200. We are going to have the Church dedication service on January 21. We would love to have 30 new benches on that date. Do you have a church or civic group or Sunday School class that would like to give a bench? And we would love to have you join us for that dedication trip January 18-23. Thanks again for your wonderful generosity that makes the school and church a possibility! This month I will turn 80 years old which for some reason sounds a lot older than 79! And there is one present I am requesting and hoping for this year. On this day, seven years ago on January 12, 2010, the earthquake in Haiti destroyed the school. We will never forget that devastating day that took the lives of nearly 300,000 Haitians and crumbled the capital city. Since then, thanks to your many gifts, the school is mostly rebuilt. But there is one building in the compound that has not been rebuilt -- the CHURCH. The former church, which held up to 2000 people also served as the auditorium for assemblies, graduations and special events for the children. During the earthquake, the second story walls collapsed and the roof fell to the ground. For the past seven years, the church services have been held in a makeshift building (tarps with a tin roof) on the school grounds. My Birthday Wish is for the church to be rebuilt in 2017!! We already have a contractor, design, and $100,000 project cost. If you know of churches, foundations, or individuals that can help make this happen in 2017, it will be a great gift to me, the school, and the many families in the surrounding communities we serve. We need small gifts, large gifts, matching gifts, stock gifts and pledges. Just let us know if you can help fulfill my Birthday Wish! We are so grateful for your continuing gifts and we pray that 2017 will be a wonderful year for you! Donate to Charlie's Birthday Wish! Hurricane Update #4 - Watch and Listen to 3 leaders say "Thank You, Merci" for their new homes! Your donations to the Hurricane Relief Fund continue to be used for good! These 3 individuals' homes were repaired and new roofs put on after damaging winds from Hurricane Matthew blew them away. Sagine, Casemir and Josene are grateful for your support! Thank you to all who donated to the Hurricane Relief efforts! The school suffered more damage than originally thought due to flooding. We are working with a Haitian contractor and consulting with two Young Life Developing Global Leader university graduates who recently earned degrees in civil engineering to solve the drainage problem. In Tent City, we have rebuilt two homes and provided water and general clean-up. And we are helping our Young Life friends rebuild in 3 communities where they minister on the coastline. The water and drainage problem will be addressed with the Hurricane Relief Fund. The water and drainage problem will be addressed with the Hurricane Relief Fund. This is Elissaint and his new home. Funds were used to rebuild a new roof! Thank you for rebuilding lives, homes and communities! The Young Life staff and leaders raised $1000 from their friends and community in Haiti to purchase and deliver 2 carloads of much-needed supplies to Les Cayes area hit hard by the hurricane. It has been a rough week watching the devastating effects of Hurricane Matthew here in the US and the Caribbean. Reports from Haiti are over 900 lives lost and 99% homes lost in many villages on the southern coast. We are thankful to share that our staff and students at the Good Shepherd School and our friends in Young Life Haiti are all safe. There was no damage to the school and children have returned to the classroom. In the tent city, where we support a small school for the poorest families, there was flooding and damage to many homes. We are working with our friend, Wooby, a member of the tent city committee, to bring relief to the residents. Hurricane Relief Funds already at work - shelter, water, disease prevention! As we write this letter, Hurricane Matthew is set to make landfall in Florida. The devastation it has left in its path is horrific. Reports from Haiti are nearly 300 lives lost and 99% homes lost in many villages in the southern coast. We are thankful to report that our staff and students at the Good Shepherd School and our friends in Young Life Haiti are all safe. There was very little damage to the school. In the tent city, however, where we support a small school for the poorest of the residents, there was flooding and damage to many homes. We are working with our friends, Wooby and Papouche, to provide 6000 gallons of water, rebuild two families’ homes and clean up the area. As many of you know, our school director, Chedrick Canéus, also directs the Young Life work in Haiti. We desire to support their relief efforts, as well, and hope to provide some funding to rebuild a roof on the YL office in Miragoane. We are committed to support our Haitian partners to provide them resources to meet the needs of the communities they serve. Thank you for your continued prayers for Haiti and all who have experienced the devastating effects of this hurricane. Wooby and Papuche assess the damage at "tent city" where we support a small school for the poorest residents. Trash Dump to Soccer Field! We are very proud of our friend Wooby and his leadership at "tent city."